Rice 41, Texas A&M 7, Nov. 15, 1947. Rice Field as seen from westerly aerial view. University Boulevard is in the foreground; South Main perpendicular on the right. Rice Field saw the first game ever played by the Institute in 1912; it saw Rice's first-ever Southwest Conference Championship in 1934, when the Owls were led by a rangy runner from Eagle Lake, Texas, named Bill Wallace. It saw perhaps the most controversial Rice-Texas game in the history of the series (at least until 1991) when, in 1938, Ollie Cordill scooped a Leche Sylvester pass just before it hit the turf in the Texas end zone for a 13-7 Rice win. Ancient Orangebloods still claim they were robbed on that one. Then, Rice came out smoking after the war years. In 1946, the Owls were 9-2, ranked 10th in the final AP poll, with an 8-0 win over Tennessee in the Orange Bowl capping the season. The powers that be put in motion plans for a huge, new stadium (originally called "Houston Stadium") that would showcase the Owls. In 1949, Rice was 10-1, finishing number five in the nation. The Owls whipped North Carolina, 27-13 in the Cotton Bowl. They were ready for the Big Time. In January, 1950, Brown and Root broke ground on the construction of the new stadium, using concrete forms built for the ongoing construction of the Gulf Freeway. 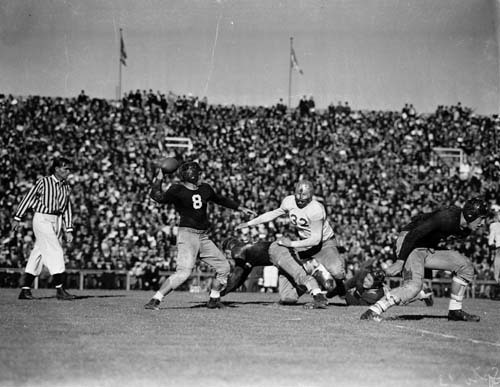 By September 19, it was finished in time for Rice to meet Santa Clara in front of a packed house in the new "Houston Stadium," and the era of Rice Field was over. 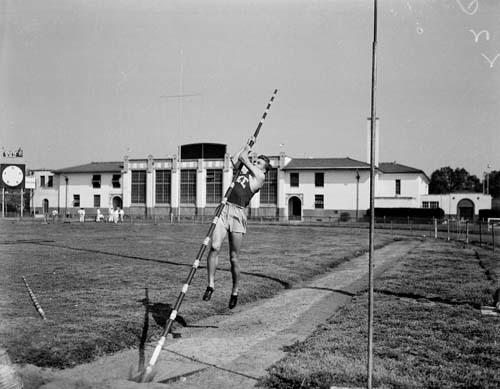 The old grandstands were dismantled in 1951, except for a pair of bleachers on each side, and the grounds continued to be used for track and field. The south bleachers were taken down in the mid-70s. Now it serves as a track and soccer stadium for Rice athletics. 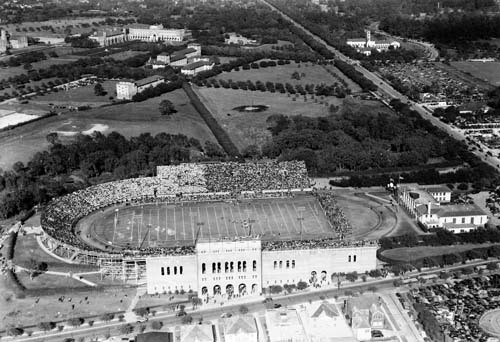 This is an aerial view of the southeast corner of the Rice campus taken in 1949. Rice Field is in the foreground. 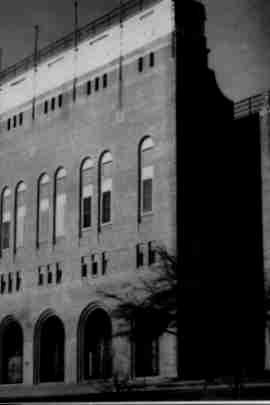 The building in the open end of the stadium is the old Field House, also demolished in 1951. South Main runs left to right at the bottom of the picture; University Boulevard runs along the left margin. The curved, treelined area to the right is Harris Gully, a small stream which drained Southampton subdivision and the campus. It was gradually filled in over the years, but the low spot remains. Ye Old College Inn was across South Main, with Youngbloods and Bill Williams restaurants adjacent. 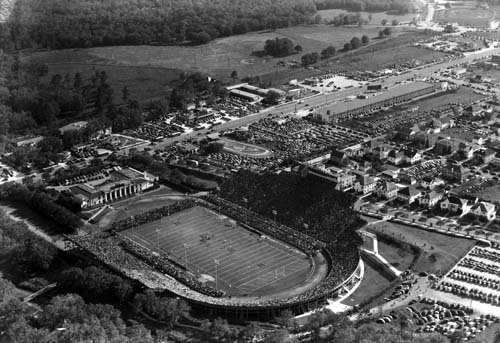 Another aerial view of Rice Field, this one taken during the 1941 season. 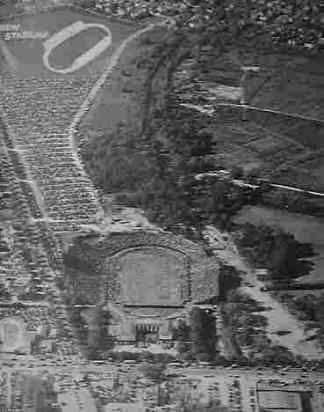 Note the stepped grandstand on the west, 'home' side. The permanent grandstands were sufficiently elevated so as to allow temporary bleachers to be place on the cinder track behind each sideline, to stretch the capacity of the stadium. And it's a full house -- right at 40,000. In the background, 'Restaurant Row', across South Main, is visible, as are private homes in Southgate, behind the main grandstand. Note also the paved parking lot to the west. That's what's lying underneath the turf of Wayne Graham Stadium, er, Reckling Park, now. A good view of the old Field House, which arose between the east edge of the cinder track and the South Main right-of-way.